You'll find a wide range of events are available to help you in your career planning and job search, while you're here at City and in the years after you graduate. The Careers Service presents a series of events for final year students to help you connect with employers and stand out in recruitment processes. Get familiarised with a diverse range of employers and numerous opportunities they offer. Graduating in summer 2019? Join us for a series of careers sessions from how to find graduate level opportunities across different industries, to communicating what you have to offer employers, and optional sessions on job applications and interviews. 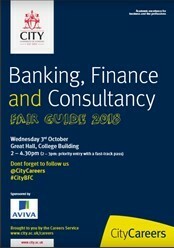 We will be holding City, University of London’s Graduate Jobs Fair on Wednesday 19th June. You will get an opportunity to meet employers from across a range of industries who are keen to engage with you. Many of them will be shortlisting on the day so if you are a (recent) graduate, postgraduate or final year student, this Fair is for you. City Career Fairs are formally structured events where 20 to 35 employers are represented, each with their own stand. This is a rare opportunity to meet lots of companies within just a couple of hours. You will be able to speak with human resources ( HR ) representatives that can go into detail about the company's application and selection process, as well as graduate trainees that have been with the company for one or two years. Graduate trainees can talk to you more about their personal experience when applying, as well as their role duties. 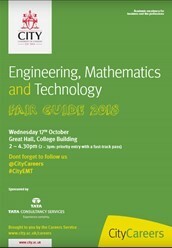 Why attend a Career Fair at City? Registration will open for City's Career Fairs and preparation workshops very soon. 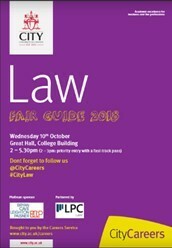 Take a look at the fair guides below from 2018 for a taste of what our Career Fairs are like. 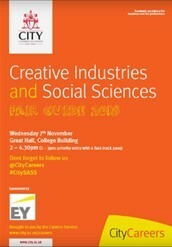 Each sector-specific fair will have a preparation workshop on the Monday prior to the event. You should attend this workshop to get top tips on how to network with and impress employers. You'll also collect a VIP pass at this session, for fast-track entry to the fair. Our annual Volunteering Fair will take place in October 2019. A date is to be confirmed. Come along to learn more about how you can get involved, meet new people and gain experience. 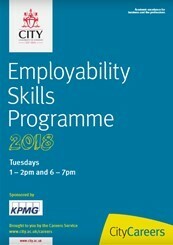 The Employability Skills Programme will prepare you to make the transition from education to work, exploring all aspects of the selection and recruitment process. These sessions will cover the skills that are most valued by recruiters, how you can reflect on these and how to articulate your experiences clearly when talking to employers. We hope you join us for all 10 session, however for students who attend 8 of the 10 available sessions there will be an exclusive awards ceremony delivered by our sponsor (sponsor TBC). Professionals from a number of organisations are invited on to campus to talk about their role, their industry and entry routes to different professions. Typically, a panel question session will follow the talks to give you the opportunity to ask questions. If you are thinking about a career in a particular sector, but are unsure which industry or role would suit your skills best, then these sessions will definitely help you make an informed decision. All panels are open to students from all courses. To register for an event please click on the title and click the "book in" button. Some companies come in to City to run skills sessions specifically to help students improve their approach to graduate job applications. These sessions may include information on CV s and application forms, interview technique, team building, commercial awareness etc.. The company's objective here is to help you to make the most of your applications which will then make their selection task easier. Throughout the year, workshops are led by our experienced Careers Consultant team. You can maximise your chances of getting a job by attending our series of information packed sessions, with hints and tips to set them apart from the others. The opportunity for you to try out some of the practical exercises which employers may use, and receive constructive feedback from fellow students and expert Careers Consultants about performance. These sessions will help you prepare both practically and mentally for the employer's assessment day. These stalls will be placed along the main corridor in the University Building (where you find most refectories). You will see sometimes employers standing there, ready to chat to you informally about a career with them, and it is your chance to get a little bit more familiar with them and see if their opportunities would suit you. Don't be afraid to stop and talk when you see a stall! Employers will be based in the Careers Service for mock interviews or CV check sessions. The intention here is to allow students to talk informally on a one-to-one basis with representatives from different companies and to ask questions that could help them decide whether they would fit into that organisation's culture. Employers use this time to share their company history, promote their organisation, describe their company culture, talk about career paths and opportunities and share tips for applications and interviews. These informal information sessions provide the means for students to learn more about the employers they are considering before participating in the application and selection process. Presentations will often be followed by an opportunity for questions either from the audience or less formally by breaking up for drinks and chat. These are events held at employers' premises that give you the opportunity to have a look around and get the feel of the atmosphere in which you would be working and, at the same time, chat to a number of company employees.